Eternal Return, box elder, stones, acrylic paints, 200mm (8in) high x 560mm (22in) wide x 230mm (9in) dia. 1. You have a full time job, a young family and you're producing many turnings, how do you juggle everything? I squeeze many productive hours of working out of thin air. Since most of my work is not in front of the lathe, the hours spent turning represent only 10 per cent of the time spent on the piece. My average week is as follows: three hours turning per day (from 10pm-1am) and 15 hours on the weekend (normally 12 hours on Saturday and three hours on Sunday). Of course, it changes when we have a family event or if I am out of town. In these cases, I have to make the time up somewhere else, such as burning the midnight oil on both Saturday and Sunday, or finding a means of working while I am travelling. 2. What causes you to go down the route of piercing and the use of colour on the turnings you produce? I focused the first three years of my turning career on just turning. I was learning and turning all the possible techniques that were available. And then Dale Nish's wormy ash vessel intrigued me. I asked myself, "What if I turned it thinner with the same wood, so thin that I could see through the vessel?" 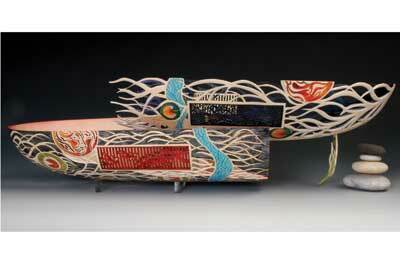 Soon after, Frank Sudol with his dental drill and pierced works grabbed my attention. He also did some fundamental airbrushing work and I saw the possibility in it. I experimented further by learning professional airbrushing techniques and taking those that were suitable for wood and developing my own way of introducing painting and imagery on my turnings. 3. Your work has been met with much acclaim and aspiration, what is your next challenge? body of work that is part of a larger museum installation in connection with a fictional work. Kevin Wallace had written River of Destiny, which told the story of my life, and the book was published in conjunction with a museum exhibition. Kevin and I discussed doing another project together and he suggested two possibilities: the first was that I undergo another great adventure - similar to the one shared in the book - which entailed being separated from my family, sent to a Communist prison camp, a daring escape from Vietnam and almost losing the love of my life. The second was that we come up with a fictional story together, with him writing the text and me creating the work. I went for the second option. Thereâ€™s no way I could do all of that again, while holding down a full-time job and looking after my career as a woodturner. 4. Tell us about the piece you are currently working on. The pieces that I am currently working on share a fictional story and include explorations of works in glass. Due to the technical challenges of casting a pierced work in glass, in some cases I have to modify the design to accomplish the effect that I want in the piece. I want to go beyond the turning, carving or sculpting of a work in wood to combine wood, glass and painting as part of a mixed media installation. 5. Which three items in your workshop could you not do without? The compressor, airbrush, and piercing drill. 6. Which turners do you most admire, and why? I enjoy works by a wide range of artists, but Frank Cummings III and Michelle Holzapfel are two who have made a lasting impression on me. I admire Frank's work because each work is like a jewel - something that attracts your eye and offers even more when admired closely. 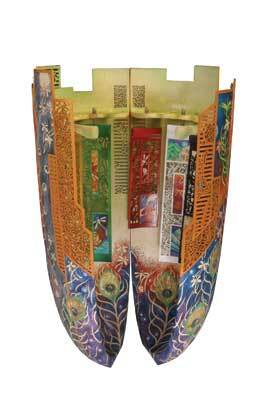 In contrast with Frank's approach, Michelle Holzapfel's work often utilises mass and is full of surprises. If I come upon a piece in an exhibition, I can usually recognise her work, even though each looks completely different than the last. 7. If you could invite anyone in the world to an afternoon of turning with you, who would it be, and why? The late Fletcher Hartline, my first turning mentor. We used to see each other every month, sometimes in his shop, sometimes in mine. We often challenged each other to see who could cut a smoother surface on a certain wood without using sandpaper. 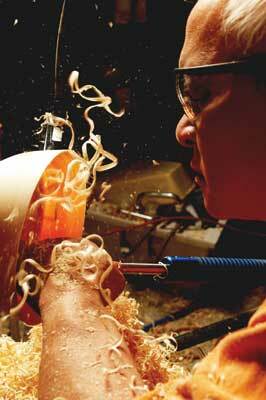 He taught me the most important things in woodturning. We spent exactly 10 years together, and never missed a single AAW Symposium until 2002, when he was so ill. He passed away shortly after. 8. With regards to your career to date, what regrets do you have, if any? Yes, I wish I could have gotten into the field of woodturning earlier. To all the readers out there - if you are thinking about woodturning but want to wait until you have more time or are retired to do it - don't! Do it now. 9. What do you think the future holds for turning? The world has grown increasingly smaller due to the Internet. The fundamental approach to woodturning will always be there, as it is a craft that offers instant gratification and will continue to attract people. The majority of these turners will remain hobbyists, and these increasing numbers will support a growing tool and equipment market. A smaller number of turners will explore and evolve their work, and that is an exciting part of the future of woodturning. 10. What book and what music are you into at the moment? I am currently reading the book Way of the Peaceful Warrior by Dan Millman. I enjoy a wide range of music, from classical music to singer-songwriters like Katie Melua.